BOARDMAN - The Nyssa Bulldogs defeated the Riverside Pirates 53 to 34 in a game played on Saturday, January 31, 2009. The Riverside Pirates led through two and a half periods but their shooting went cold in the last ten minutes of the game. Riverside came roaring out of the gate taking a 5-1 lead early in the first period. The Bulldogs clawed their way back to tie it up 7-7 with a minute and a half to go in the first. Riverside shut them down taking the 10-7 lead at the end of the first. Hot shooting Pirates in the first included Kayla Nelson and Jordan Connell. Riverside controlled the second period leading by as much as five points and outscoring Nyssa 11 to 9. Hot shooting Pirates included Whitley Reece and Amy Kegler who hit three treys in the period. Riverside ran into trouble in the third only scoring two points in the first six minutes of period while Nyssa scored 15. Nyssa led at the end of the third 33 to 27. Nyssa outscored Riverside 20 to 7 in the fourth period. Marisa Gonzalez, the Nyssa freshman, continued to be one the Bulldog's standout players on defense and offense. Gonzalez hit a couple three pointers and was successful from the foul line. Other Bulldogs in the scoring included Amanda Bittinger and Breona Bittinger. Pirates scoring in the fourth included Jessica Bradley and Kayla Nelson. 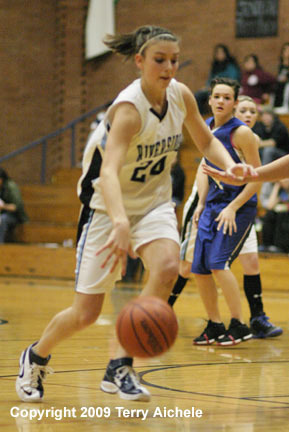 LEFT - Shannon Callow of Riverside with the ball. RIGHT - Pirate Whitley Reece takes a shot. 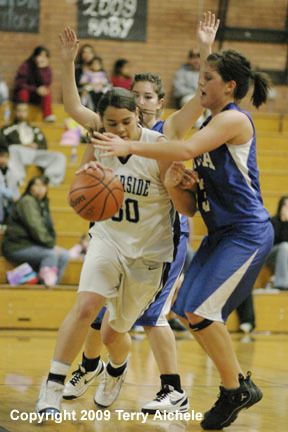 LEFT - Jessica Bradley of Riverside works her way along the baseline around a Nyssa defender. 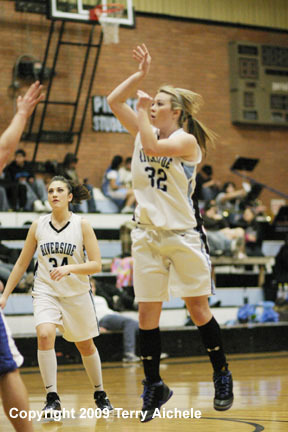 RIGHT - Whitley Reece of Riverside takes a shot. LEFT - Jennah Mittelsdorf of Riverside makes her way around a Nyssa defender. 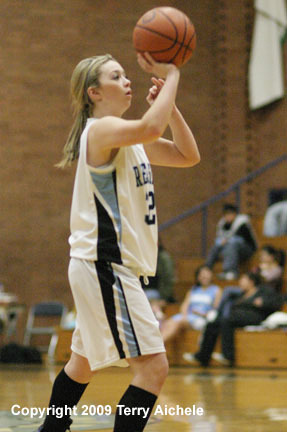 RIGHT - Shannon Callow of the Pirates at the foul line for a freethrow. LEFT - Pirate Vickie Hernandez with the ball. RIGHT - Shannon Callow of the Pirates drives along the side of the key.